Since I wrote that blog. 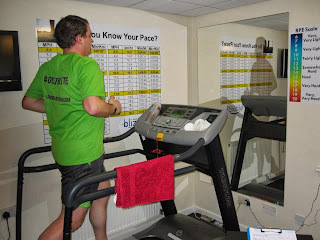 I've had a nagging in the back of my head about my HR zones when running. However given the impending target that were Outlaw I put this to the back of my mind and was determined to finish. Which I did. Now we are in the off season the nagging in my head started again. As we know I have recently started running with Blizard Physiotherapy on a Tuesday night at Doncaster track. 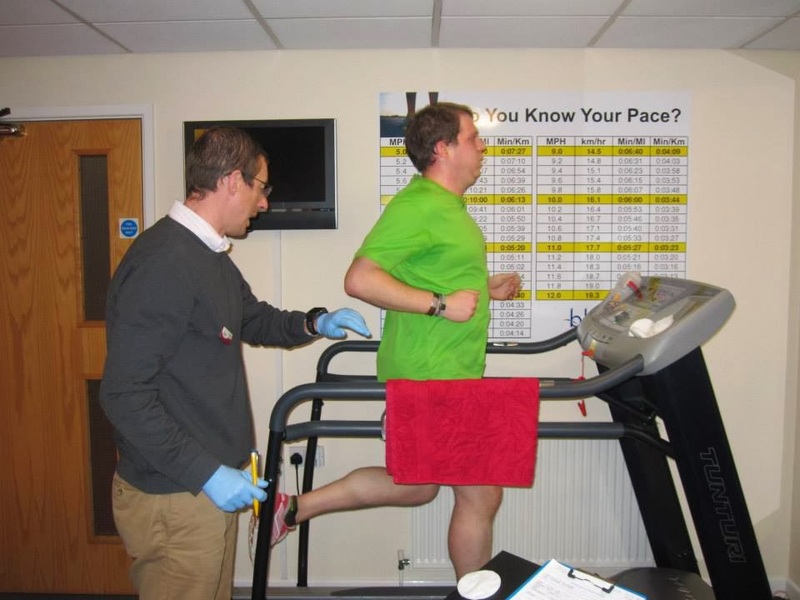 One of the services that Blizard offer is lactate threshold testing. Lactate threshold testing allows you to know your personalised heart rate zones using science. How could this not appeal to my analytical brain? Another reason I was keen to undertake a lactate threshold test was that the Ironman training plan (Be Iron Fit by Don Fink) I am shortly to be commencing involves training in certain HR zones to get the most benefit from your training. So I contacted Blizard about attending their clinic to complete a lactate threshold test. My date with destiny was scheduled for today (18th November) at 10am and with a slight sense of trepidation I drove over to the clinic. My fears were put to bed within 30 seconds of sitting down with Dave Tune. Dave used to be an international runner and his consummate professionalism had an incredibly calming effect on me. I know Dave since he leads and coaches the run sessions I attend on a Tuesday at Doncatser track. He explained how the test would be undertaken. Fisrtly we would go through my questionnaire so that Dave could get to understand me more, then we would perform the test which would involve me running on a treadmill for periods of 3 minutes before I would give a tiny sample of blood which he would then analyse to work out the lactate content of my blood. The treadmill speed would then be increased for another three minute period and this process would be repeated until all the required data had been obtained or I couldn't continue. At each minute interval my HR was taken down and I was asked for my RPE (rate of percieved effort) from a scale of 6-20. Dave would then prepare a report detailing the findings and go through these with me and give me a training plan to adhere to. So with this explained we started with stage 1. In summation stage 1 basically involved me going through my diet, training plan and a little bit more about me. Dave was alarmed at how little (read none) plain water I drink on a daily basis. Dave thinks this lack of water cold be why my weight loss has stalled of late. Well that and the fact I was probably training at the wrong HR zones. Also as part of stage one we did a body composition test where my height and weight were taken, my flexibility was tested and my body fat was analysed. I knew my height (5' 11.5") and thought I knew my weight (15st 5.5lbs that morning), cue first surprise when I tipped the scales at 15st 0lbs. Ooh I do love a good surprise. I knew I had poor flexibility but did not quite realise how bad it was. For this test we did a sit and reach test. This test involved you sitting down with your feet against a box and you had to reach and push forward a marker which was sat on a table witha ruler above the box your feet are sat against. See the picture below. I then had my body fat estimated. Dave used callipers to take four fat measurements (bicep, tricep, back and tummy) and averaged these out to work out my body fat percentage. The result was 30.2%. For the first time in god knows how long I am not in the obese category. Ooh I do like these surprises. This getting fitter lark is amazing. That was the easy part over with. Now for stage 2. Dave started the treadmill at 7.4km/h and let me warm up for about 5 minutes. He then upped the pace to 8.4km/h and the test commenced. After 3 minutes he took my blood and told me my lactate was barely elevated. He then upped the treadmill to 11 minute mile pace (my Outlaw training pace) (8.7km/h) and after three minutes took some more blood. My lactate was 2.9 mmol. He then upped the speed to 10km/h (9:32 min mile) and took some more blood after a 3 minute period had elapsed. My lactate content was 4.2mmol. 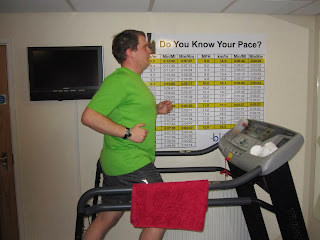 He then upped the speed to 8:40 min mile pace (11.2km/h) and took anther reading after 3 minutes. Lactate content was 4.7mmol. He then upped the speed to 7:45 min mile pace (which equates to a sub 24 min 5k) 12.5km/h and took a lactate reading after another 3 minutes which came out at 8.4mmol. Finally he upped the speed to 12.9 km/h (a pace of 7:30 min/mile) and after three minutes took my final blood sample. I am not going to lie, I was dying by this point. My lactate content of 10mmol agreed with my general feeling. Struggling on the last bit of the test. The test then concluded. After I had been for a shower, Dave then explained the results to me. Dave was shocked at how fit I was as he didn't think the test would go as well as it did. Now for the one bit of bad news. It appears my body is more suited to running shorter distance races at higher intensity than longer ones at lower instensity. So more sprint / olympic than iron. It also transpires that I have been training too slowly (I may as well have been "walking to the shop to pick up a copy of the Sun) and I haven't been running enough distance every week. Jenny Blizard also explained why I have been struggling so much at track. I have been doing most of my training below my recovery run speed and then going to track where I have been attempting to train above my lactate threshold. Ah so that explains why I have been half dead after every track session. With this Dave explained that I need to not do tempo runs for the near future but to instead build my base endurance by completing threshold runs but for thise threshold runs to be completed at a higher intensity. 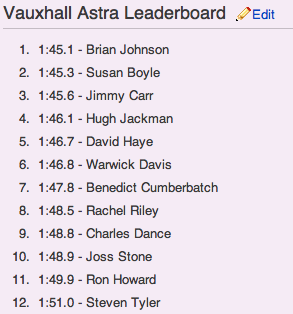 The important bit is my HR zone results and these are as follows. As you can see there are some vast differences between the estimates from Don Fink and my actual zones. I knew something wasn't right with my HR all those months ago when I wrote my blog post. I will be using these zones to tailor my training over the coming months which according to Dave will result in greater weight loss as another benefit. If you can afford one I would really recommend a lactate threshold test as although the formulae from Don Fink may work for some people, I am proof that it doesn't work for everyone. Dave then explained that my sub 24 minute 5km target is very achievable within the next 8 weeks and gave me a sample training plan for the next 6 weeks. I found this test from Blizard Physio to be invaluable and am really looking forward to using these zones in the future. Dave summed up the past 18 months as training my body to be fit instead of sedentary and said that this lactate test was a line in the sand and now it is time to train to be a runner. Dave then gave me some stretched to improve my flexibility which will also help with increased running speed. Now I need to use my Garmin to set these zones and I won't be training outside these. Cue a lot of "BEEDLEBEE" noises from my Garmin again. I now have a renewed vigour and enthusiasm for running. Thanks to Dave and all the team at Blizard Physio.